The No. 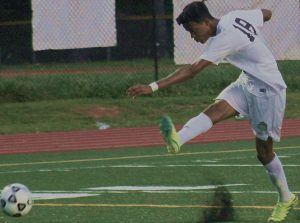 3 ranked Druid Hills Red Devils needed seven penalty kicks to upend No. 1 ranked Blessed Trinity 2-1 on Tuesday to advance to their fourth state championship game in school history. Druid Hills (16-6-0) was playing on the road for the first time during the playoffs and were up 1-0 when a second yellow card put them a man down for the final 30 minutes of the game, including overtime. Hasib Fudacel used a pass from Orie Stockton to put Druid Hills up 1-0 with 18:03 in the first half. The game was back and forth until the 20 minute mark of the second half when the yellow card put Druid Hills down a man. Blessed Trinity (13-5-4) tied the game on a penalty kick with 13 minutes to play and the Red Devils playing a man down was able to keep the game tied and send it into overtime. No scores in overtime set up the penalty kick session to decide the game. The Red Devils chose to go second in the penalty kicks and the session was tied 1-1 after both teams’ first attempts. Druid Hills missed its next two attempts, but tied the session at 2-2 on Fudacel’s kick. Connor Logue and Anderson England followed with makes of their own as the score was 4-4 with Blessed Trinity shooting. The Titans’ shot hit the post as Druid Hills’ goalie Josh Lloyd, who had 3 saves in the pressure packed session, dove to cut off the ball to give Druid Hills the opening to close out the game. Will Johnson connected on his attempt giving the Red Devils the victory and a fourth trip to a state championship game. Druid Hills has played in three previous state championship games losing all three to DeKalb rivals including 0-1 to Briarcliff (1972), 1-3 to Lakeside (1978) and 0-3 to Redan (1988). Eight other appearances in the Final Four the Red Devils came up short, the last a 2-0 loss to eventual state champion Chamblee in 2008. Semifinal appearances came in 1969, 1970, 1971, 1972, 1977, 1978, 1988, 2004, 2005, 2006, 2008 and 2017. Druid Hills faces off with No. 2 ranked Southeast Whitfield (19-2-0) at 2:30 pm on Saturday at McEachern High School. Southeast Whitfield advanced to the finals with wins over Jefferson (6-2), Woodward Academy (5-2), No. 10 Richmond Academy (7-0) and No. 4 Marist (3-1). The Red Devils’ road to the finals includes victories over Spalding (5-0), No. 9 Northeast Whitfield (2-1), No. 8 Cartersville (4-0) and No. 1 Blessed Trinity (2-1).